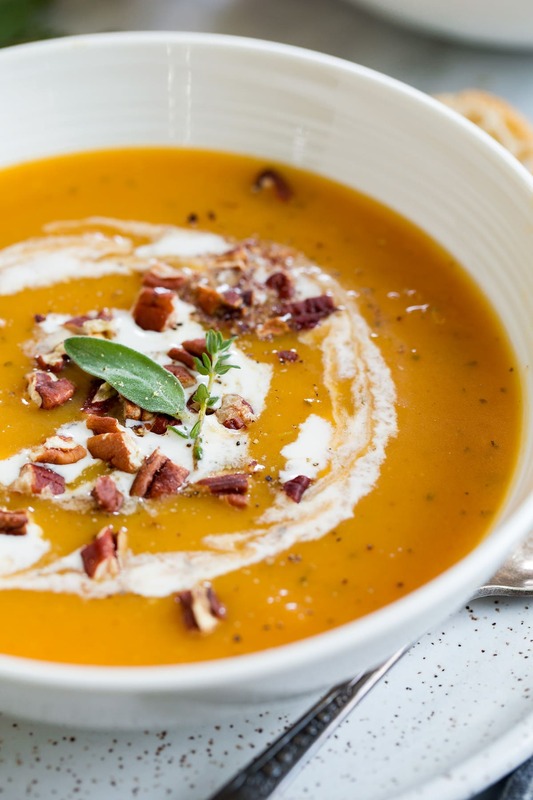 Butternut Squash Soup could there be a more fitting fall soup than this? It’s so fresh and healthy, it’s deliciously creamy, and you’ll love the blending of simple flavors. It’s a bowl of pure autumn bliss! 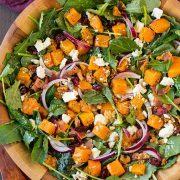 When this time of year rolls around I’ve always got a few butternut squashes sitting on the counter to cook with so I’m often looking for new things to add them too. 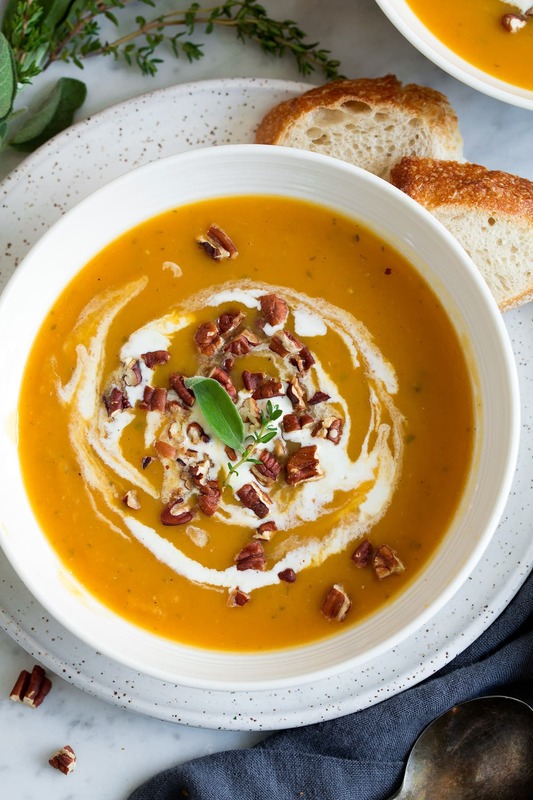 And now we need to add this super tasty butternut squash soup to that list! 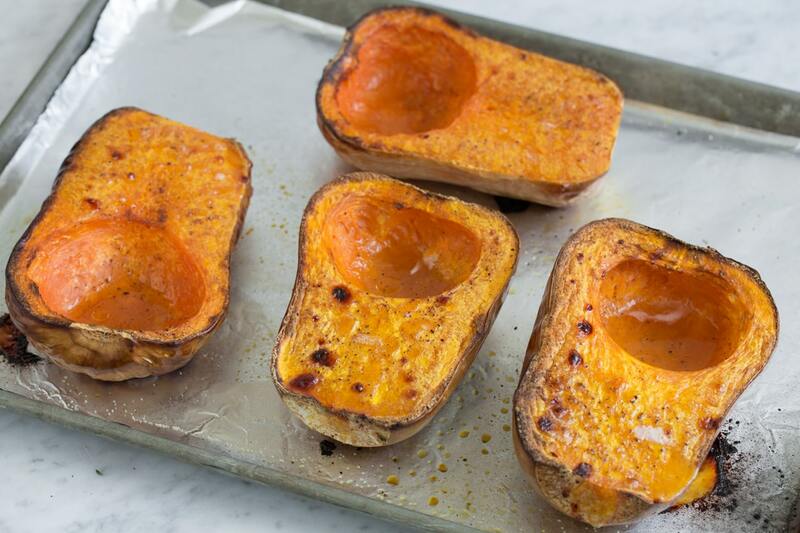 Start by roasting the squash halves on a baking sheet until tender and slightly browned in spots. Meanwhile saute add apple and onion in olive oil until nearly softened, about 8 minutes. Add garlic and saute 1 minute. Pour in chicken broth, sage, thyme, rosemary and nutmeg. Bring to boil then reduce heat to medium-low, cover and simmer 15 minutes. 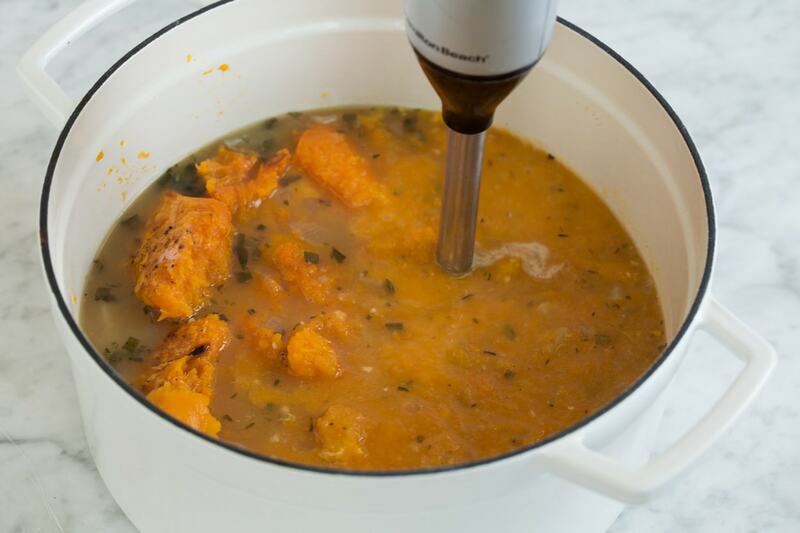 Scoop roasted squash flesh from skin and add to soup. Blend with an immersion blender until smooth. 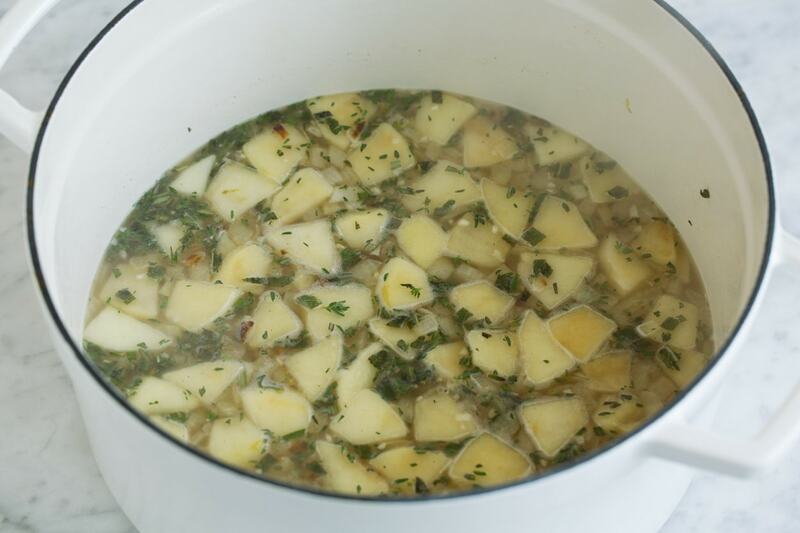 Thin with water to reach desired consistency, heat soup through over medium-low heat if needed. Stir in cream or add to each individual serving along with pecans. 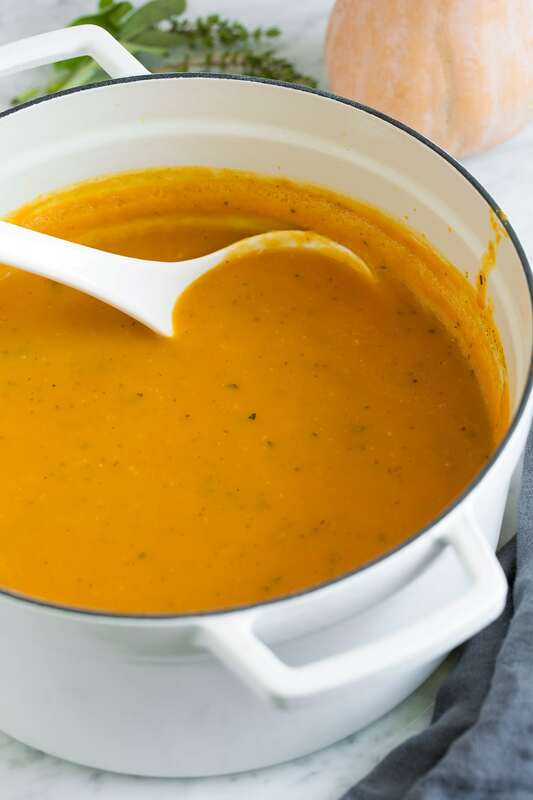 There’s just something about a homemade soup that’s good for the soul and this butternut squash soup is no exception. Sure there are restaurants with plenty of good soups but a really good homemade soup will always be my favorite, maybe it’s the added love that goes into it. 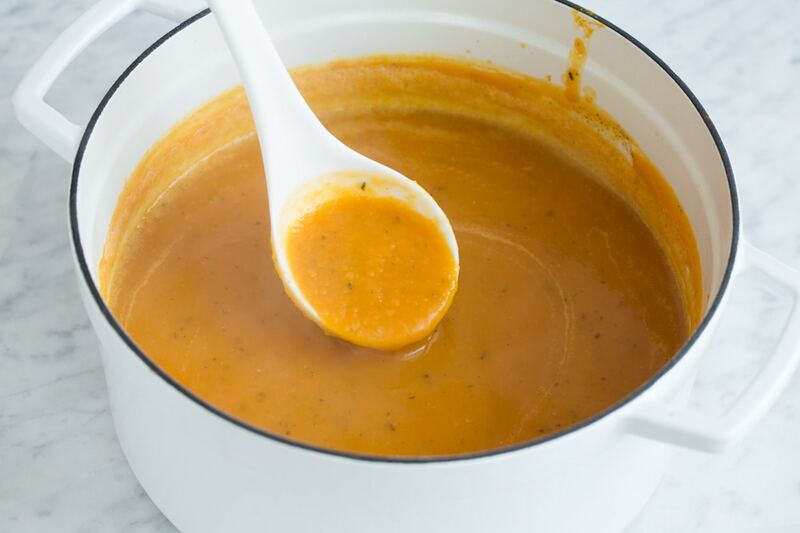 One of the things I really love about this butternut squash soup is the fact that the squash is roasted. I love this for for a few reasons. FLAVOR. Roasted squash is much better than boiled squash. EASE. No need to peel, seed and chop squash here! You just halve and roast, then the squash flesh scoops out so easily. LESS MESS. Since you don’t have to do all that peeling there’s less mess to clean up. You just cook them on a sheet of foil then wrap it up and toss it. Can I Use Dried Herbs or Other Spices? If you don’t have fresh herbs on hand or would just prefer to go the cheaper route dried herbs could be used here instead. For dried I’d use 1/2 tsp sage 1/4 tsp thyme and 1/4 tsp rosemary. A little goes a long way here you want to let the flavor of the squash shine. Then if you don’t want to go the herby route you could also just go with a spiced route by using dashes of nutmeg, cinnamon, ginger and cayenne pepper. Or try a curry version by adding 1 Tbsp curry powder, or to taste in place of the herbs and nutmeg. I Don’t Own an Immersion Blender What About a Regular Blender? I love these ease of an immersion blender and you can find a decent one for $20. If you ask me it’s worth the investment, but you can definitely get the job done in a regular blender too (just more of a hassle and mess). If going the blender route work in batches filling blender no more than halfway full. Remove center piece of lid, cover with a clean kitchen towel and blend on a lower speed until smooth. Repeat with remaining. Are the Toppings a Must? I love the extra layers of goodness atop this soup. 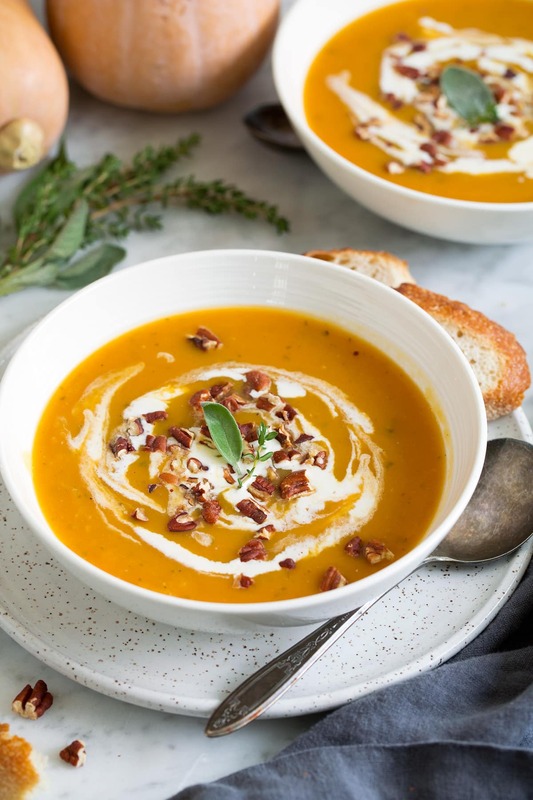 The cream adds hints of creamy richness and the toasted nuts add flavor and textural contrast but of course this soup is delicious plain if you want to stick with more basic. 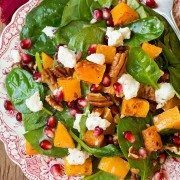 Another good option here would be shelled pumpkin seeds in place of the pecans. 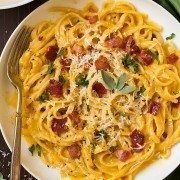 Is there a Substitute for Heavy Cream? Half and half can be used as well, I’d use a little extra. Then for a dairy free option I’d try cashew cream. Or you can just omit cream altogether as mentioned before. 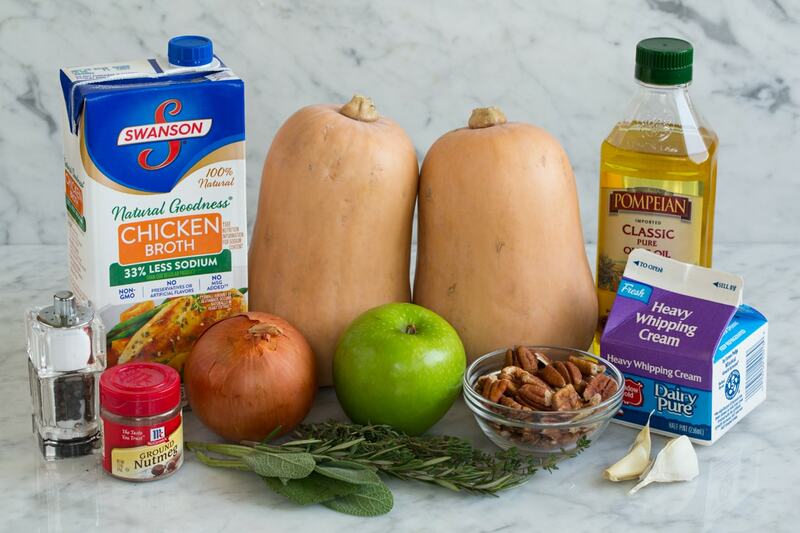 This is a perfect autumn soup! 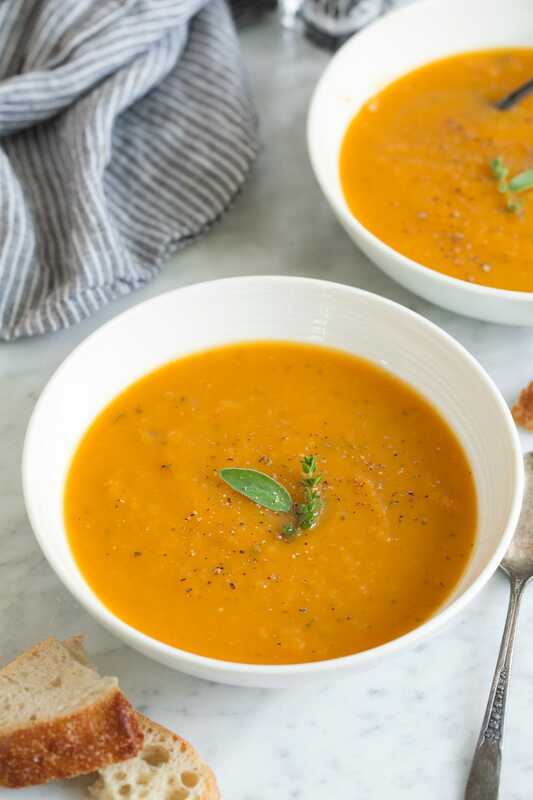 It's made with roasted squash halves (which are easy to prep and they add great flavor), a granny smith apple and fresh herbs. It's deliciously creamy and just good for the soul comfort food on a cold day. Preheat oven to 400 degrees. Line an 18 by 13-inch baking sheet with aluminum foil. Place squash halves on baking sheet cut side up. Brush with 1 Tbsp of the olive oil and season with salt and pepper. Roast in preheated oven until tender and slightly browned in spots, about 50 - 60 minutes. Meanwhile heat remaining 1 Tbsp olive in a large pot over medium heat. 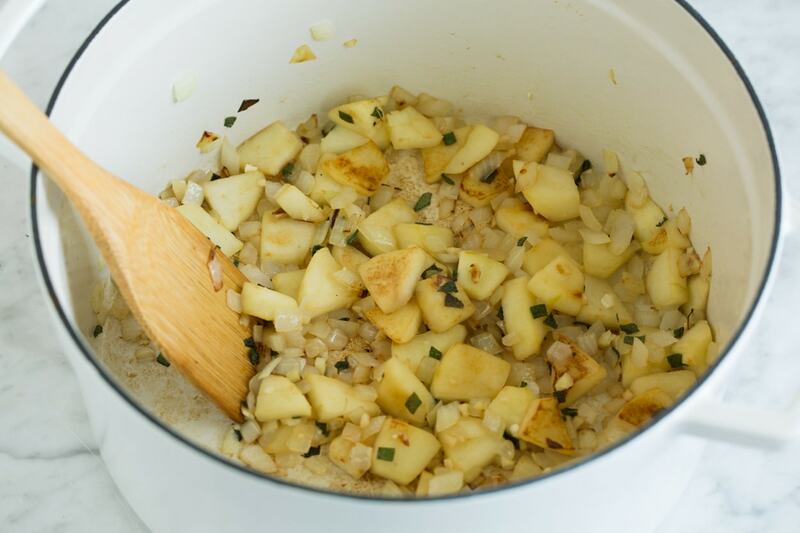 Add onion and apple and saute until nearly softened, about 8 minutes. Add garlic and saute 1 minute longer. Pour in chicken broth then add sage, thyme, rosemary and nutmeg. Bring mixture to a boil then reduce heat to medium-low, cover and simmer 10 - 15 minutes until apples and onions are soft (then remove from heat if squash isn't done). Scoop roasted squash from skin and add to soup. Puree with an immersion blender**. Season with salt and pepper to taste. Thin with water to reach desired consistency, heat soup through over medium-low heat if needed. This can also be pureed in a blender if you don't own an immersion blender. See notes in post above for directions. Dried herbs can be substituted here or alternate seasonings can be used for a different flavor profile. See notes in post above.